A rare and valuable 2014 Nissan Sentra was involved in a 3-car accident on Houston’s Southwest Freeway, suffering fairly serious damage. Luckily, no one was seriously injured. Oh, and the other cars were a Rolls-Royce Wraith and a McLaren 12C. The drivers of the two cars that were not Nissan Sentras seemed to have known one another. It’s not yet clear if the McLaren driver and the Rolls-Royce driver were out specifically looking for Nissan Sentras, or if their Sentra-encounter was just chance. 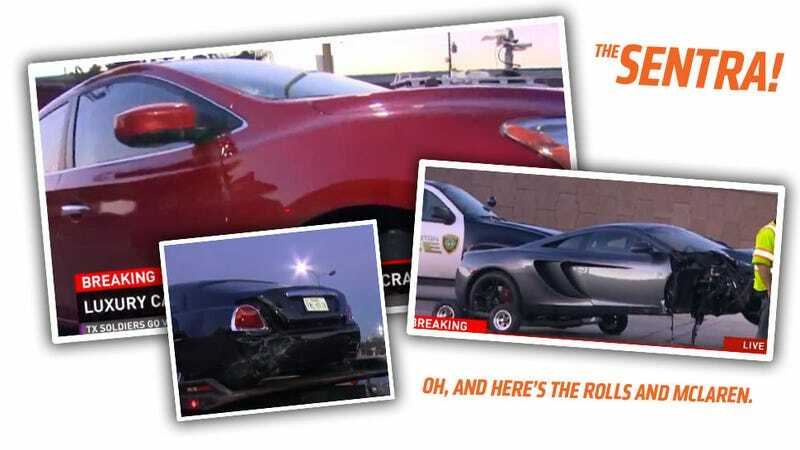 It does appear that the Rolls-Royce hit the Sentra, and the McLaren then impacted the Rolls. Counting the Sentra, there was over $500,000 worth of cars involved. It is a well-known activity in the motoring community to seek out Nissan Sentras so other car owners, such as the ones in the Rolls-Royce Wraith or the McLaren 12C, can offer their admiration and respect. The condition of the Sentra is not yet known at this time. It’s highly likely the McLaren and Rolls-Royce owner will offer their cars for parts or raw materials to get the Sentra back up to original condition as soon as possible.